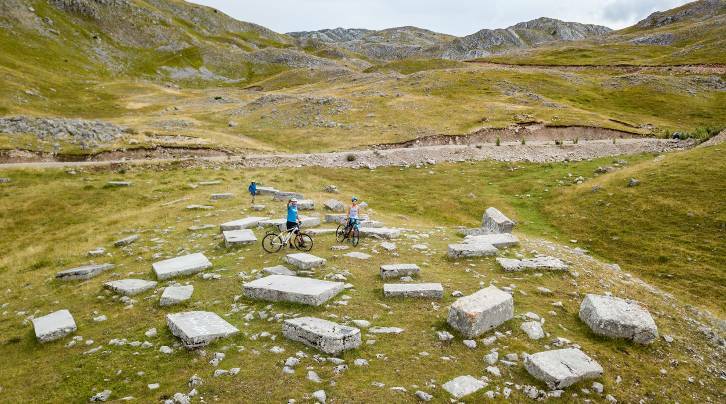 This is a 3 days pioneering self guided bike tour through the remote mountain regions connecting Mostar and Sarajevo – Herzegovina with Bosnia. The natural beauty is truly stunning, with ancient forests, rugged peaks, hidden waterfalls, alpine lakes and rivers where you can stop for a swim en route. It’s not surprising that the region is known by locals as the Herzegovinan Himalayas. Your rides take you deep into the mountains passing small isolated settlements where the way of life has remained unchanged for centuries. 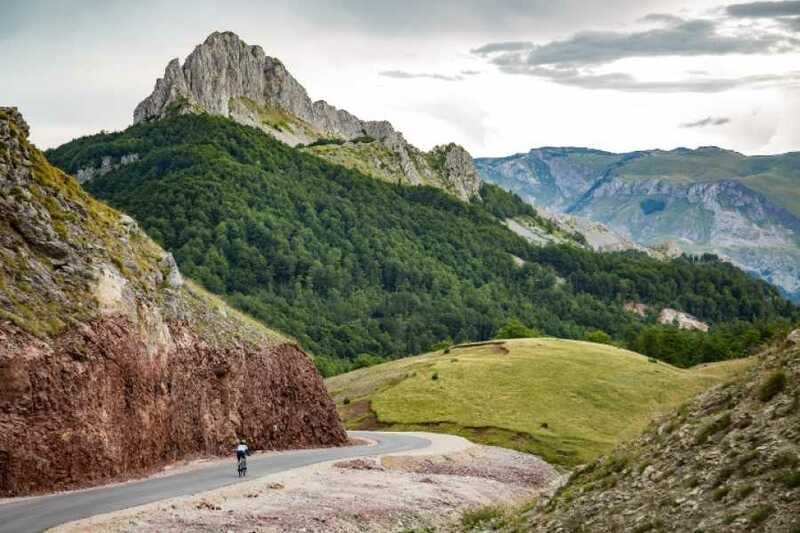 Both on and off the bikes you have an opportunity to explore the unique cultural heritage bestowed on this small ancient mountain kingdom. Medieval tombstones scattered around the side of the road tell of a time long past. Charming Mostar with its famous bridge a symbol connecting East and West. 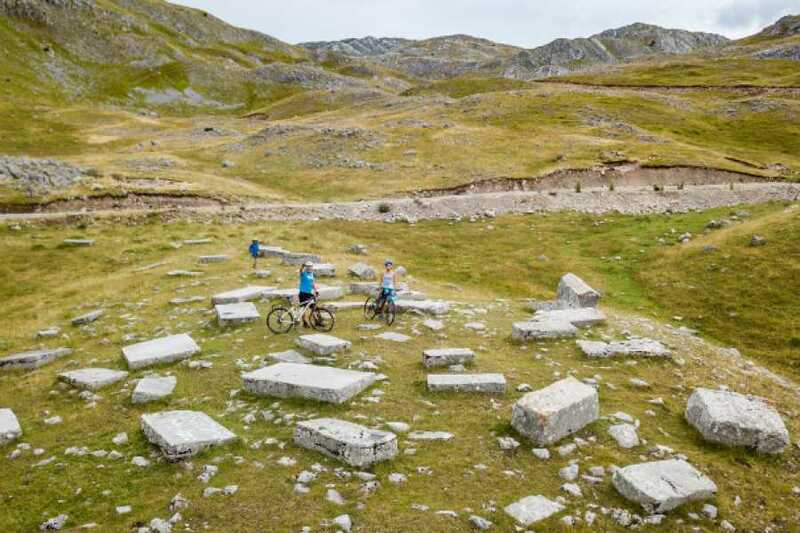 And, Sarajevo, Bosnia and Herzegovina’s capital and host of the 1984 Winter Olympics games, are all within arms reach during this unforgettable three days of riding and exploring. This trip can be done as a 5 days cycling trip, with Lukomir Highland Village extension and extra night in Sarajevo. 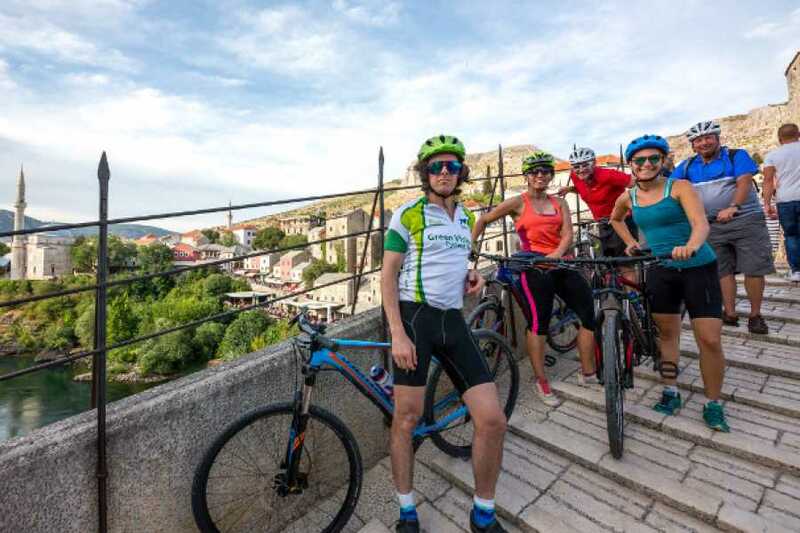 Other option is doing the rides vice versa, cycling from Sarajevo to Mostar and Dubrovnik along old Austro-Hungarian Narrow gauge railway revitalised as cycling track. Day 1: Biking from Mostar to Warm Emerald Waters of Boracko Glacier Lake. Early morning on your first day, your route takes you out along the aqua-green Neretva River. 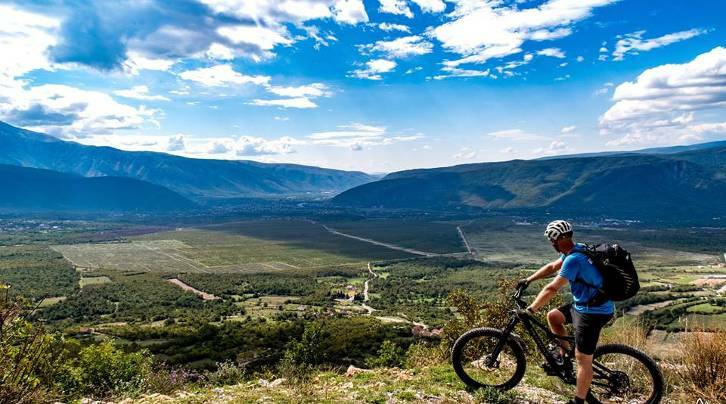 Leaving Mostar behind, you warm up our legs and cycle to the village of Potoci surrounded by endless vineyards with rows of authentic Blatina and Zilavka grapes only found here in the dry karst regions of Herzegovina. 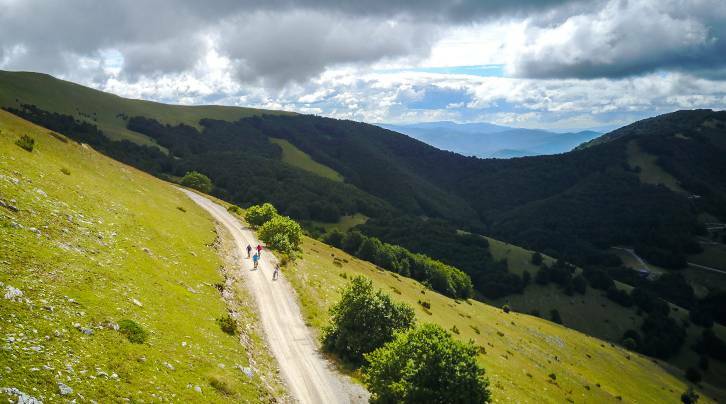 From these lowlands, you start your spectacular ride across the Prenj mountain range. This is a challenging ride with switchbacks and climbing on a mix of decent gravel and asphalt roads. You pass by Ruiste, a small mountain village with a lonely ski resort located on the edge of Prenj. OPTIONAL: Stay an extra day at Boracko lake and discover firsthand the thrills of white water rafting on the Neretva river. Day 2: Caravan route over three distinct mountain ranges in the Dinaric Alps. 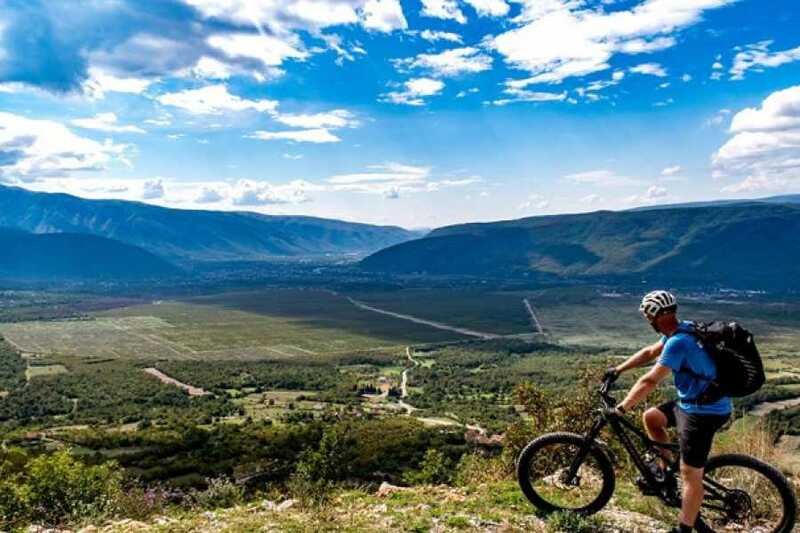 Today you’ll cycle from Boracko Lake to the mountain village of Umoljani along the “Caravan” trading route once used during the Ottoman era. 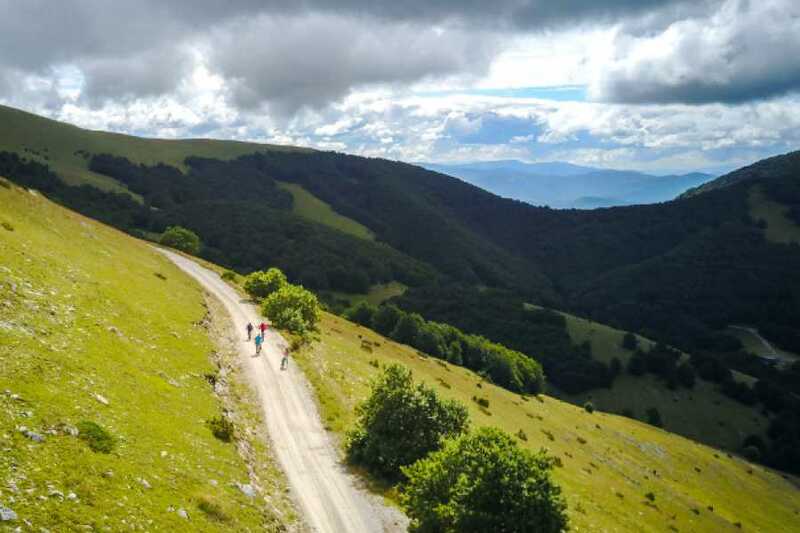 The gentle asphalt road will soon give way to a more challenging and steep dirt-and-gravel road on a stretch between the Prenj and Bjelasnica Massifs through the heart of the Visocica Range. On your final morning, you’ll stare into the distance and study the day’s path from Bjelašnica to Igman Mountain, the site of the men’s downhill and ski jump during the 1984 Olympic Winter Games. OPTIONAL: Not so keen on descending on a good gravel road? Then we suggest you ride into Sarajevo using an alternative equally scenic and reasonably quiet asphalt road. Bike Rental is 45 EUR per person per trip and includes: fully equipped rental bike for the duration of the tour, helmet, patch kit, spare tube, pump, lock, rack and water bottle holder. Mountain bike, Specialized RH Comp/Sport 2016/2017, 20-speed. Neretva White Water Rafting Extension: 100 EUR per person. Includes extra night at Boracko Lake, Full Board, Transportation to and from the rafting. This extension can be done after finishing Day 1 of your bike ride. Transfer by public Bus: Sarajevo – Dubrovnik: 38 EUR per person (Departure times during the summer – everyday 2,30 pm and 10,30 pm). 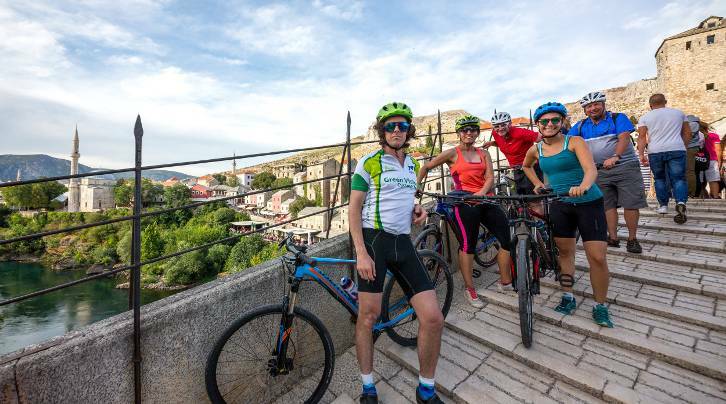 Cycling Narrow gauge railway in Herzegovina to Dubrovnik regions was built in the early 20th century and connected Mostar with Dubrovnik and Konavle in Croatia. The first ‘’Ćiro’’ passed this railway on 15th July 1901. As the railway was abolished in the 70s idea for revitalising it as biking trail that connects two different cross border regions as a unique tourism offer showed as a clear historical and cultural identity decision. Opened in 2017, this spectacular route takes you across the border and through some beautiful tourist attractions from both regions (B&H and Croatia) following karst field, wineries, old Monasteries and pilgrimage places, bridges, tunnels, rivers, fields, etc. and this trails will connect all these attraction together. Contact us for more information and price details. What is included: Accommodation: 1x night Hotel and 2x nights Family-run Pension in Twin/Double rooms with ensuite Bathroom; Food: 3x breakfasts, 2x packed lunches, and 2x dinners; 24/7 hotline number (support) Green Visions office; Luggage transfers between stages; Navigation package: GPS tracks & road-book. What is not included: Bike rental; Flights to & from Mostar, Bosnia; Meals not specified in itinerary; International Travel insurance; Optional tipping to local staff; Souvenirs and items of a personal nature (sodas, alcoholic beverages, laundry, etc. ); Any items not specifically mentioned in the program. ​Options: Price is per person, double occupancy; Single rooms are available on a request basis at certain places; All travellers will be paired with a same-gender roommate when a roommate is available. What to bring: Cycling gear is recommended / padded shorts, suitable footwear, day pack, 1 litre of water, rain gear, helmet and water bottle. Please contact us if you need any equipment (helmets, water bottles etc).